Log into the site and click the button http://www.photosnack.com Make a slideshow to start creating photo slideshow. Next will appear choices Sign in and Register, for the first time you create a slide show select Register and recharge your name, email address and email password and click the Register button. Acknowledgments will appear and you are asked to verify the email sent by photosnack.com to email you. 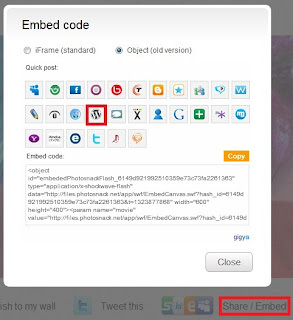 Verify in advance in the email you then return to the site photosnack.com then click the Continue button. Next select only My computer and click the Browse button to select the number of images that exist on your computer, the process will take slightly longer depending on the number of photos would be added. Types of images that support the extension jpg, jpeg, png and gif and size of each photo should be no more than 10 MB. If the upload is complete then click the Next button (on the upper right corner). Perform the selection of templates that you want by clicking the image template, the template will appear if no match previews just click the Cancel button and vice versa if it is to find the appropriate option button Use this template and then click the Finish button. Click the link below Direct link, the link will appear in a new tab. Then click the Share / Embed see picture no. 7 the bottom to find out his position. 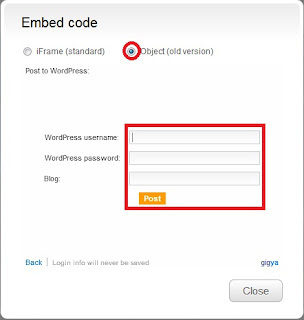 Select the type of blog that would be used, in this post I chose WordPress, it will display a dialog box HTML code. In the dialog box select Object Embed Code (old version), enter the username, password and address of his blog and click the Post button, wait until it says Thank You posted the item and then click the Close button. Well now the final step to open your wordpress blog, then select Writing> All Posts, there is no concept of postings that have been sent automatically by photosnack.com you edit it and select HTML mode and copy the HTML code into your text widget. The results look like on my blog under the right. 0 Komentar untuk "Create a Slideshow On The Blog"